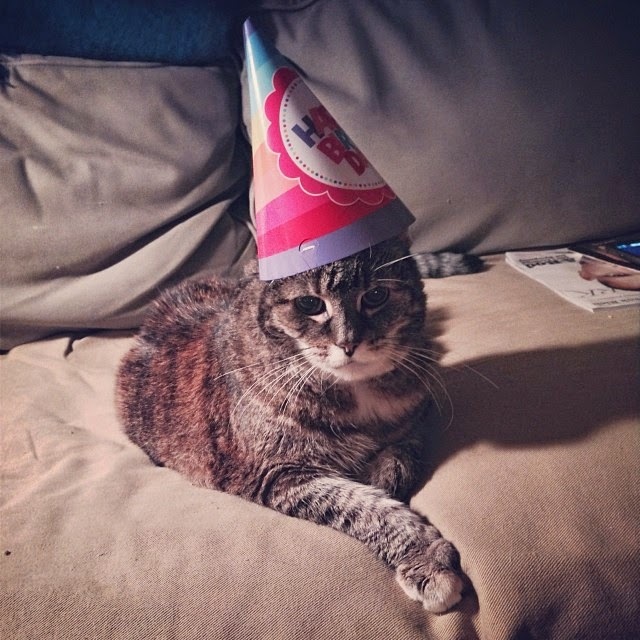 TD and I had the most wonderful cat for seventeen years named Rose but recently we had to say good-bye and put her down. Oh, it is so hard and heartbreaking to lose a beloved pet. We found Rose on a farm seventeen years ago in Fort Edwards, in upstate New York, near where my uncle Brian and his wife Susan live. Susan had spotted a sign for kittens at the farm and so we went down to investigate. It was a Fourth of July weekend and the farmer and his wife were not home. But we watched the passel of kittens roaming around the yard and we chose our favorite who was the most lively one. We returned later when the farmer and his wife were there and picked up the kitten and named her Rose. She was wonderful company over the years, a sweet girl who enjoyed being with people. She would follow me from room to room like a shadow. She liked to sit in between us on the couch, and she got on the bed at night and slept next to me. Later we got a little cat named Bell, and they were often together and touched each other when they slept. 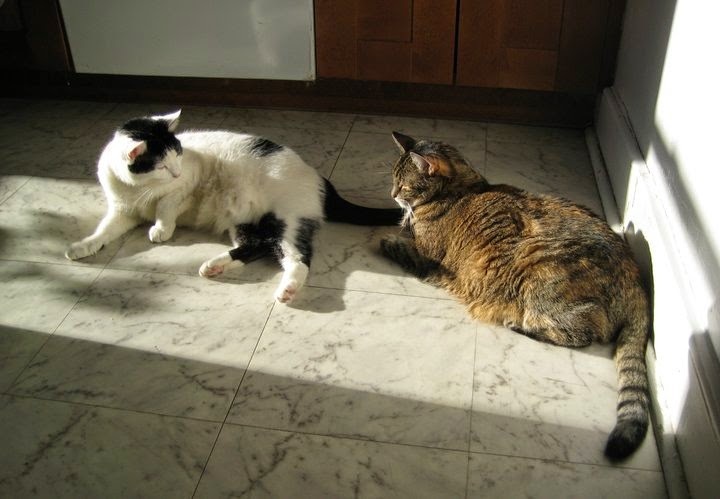 Kidney problems and thyroid problems are common in older cats, and Rose developed some but we did not treat them really aggressively because we had been badly burned in the past by a terrible vet. When our first cat Katie was twelve years old she had a thyroid issue and we took her to Dr. Ann Wayne Lucas at Washington Square Animal Hospital on E. 9th Street. 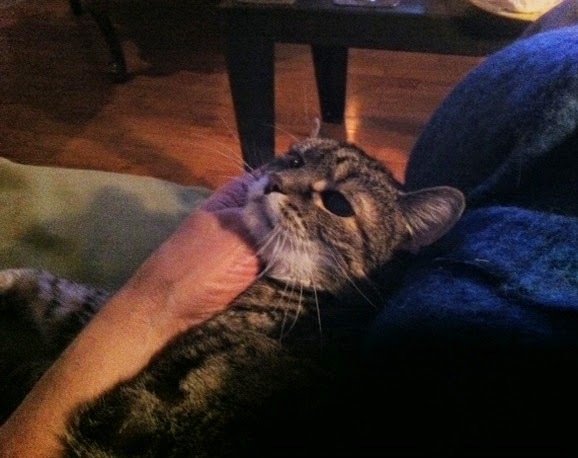 For Katie she prescribed Tapazole which caused the cat to become anemic and after $5,000 of blood transfusions (at the Fifth Avenue Veterinary Specialist hospital on W. 15th Street which you should avoid at all costs), our cat Katie needlessly died. Dr. Ann Wayne Lucas was not familiar with this reaction to Tapazole, even though a simple Google search shows that it can be a problem. After Katie died, she sent us a condolence note which said it had been "a learning experience" for her. Terrible vet. Terrible place. Do not go to Washington Square Animal Hospital or Dr. Ann Wayne Lucas. We have a wonderful vet now - Dr. Maureen Hurson at City Vet Care on West 72nd Street who is fantastic and we recommend her highly. We had old Rose checked up regularly and she was doing ok but one day a couple weeks ago she started to fail. Without going into the myriad details, we were told that the problems were insurmountable and that it this point she would be very uncomfortable. And so we decided to let her go so that she would not suffer further. It all happened very fast over one weekend in August and it was a shocking development. Afterwards, my heart actually hurt. We miss her terribly. Bell seems to be depressed without her and sometimes Bell cries out. Rose was a good companion for all of us. So very sorry to hear of your terrible loss. Uncomplaining to the end, I believe our animals want to spare us the heartache and will sometimes literally leave us, to be on their own to die. Amazing creatures, all. I'm not surprised that Bell grieves the loss too but you did the right thing for little Rose. I am so happy to hear from you! Over the years, it never fails...I shed tears for my little babes long gone...but are they really? I just close my eyes and there they are, still sweet and full of Life. Perhaps WE will shimmer as such for those who will miss us, yet all the while remain untouchable. You did all you could...WITH LOVE! My deepest condolences to you on your loss of sweet Rose. Pets are family. I know what you're going through because I lost my dear Theodora, a 13-year-old tortoiseshell, this past weekend. She died right in front of me. Don't know exactly what it was, but probably a heart attack or an aneurysm of some sort - she stumbled, fell onto her side, gasped for breath a bit and then died. The whole death took less than three minutes. My heart is broken, but I am comforted by family and friends and by the wonderful memories I have of Theo, my first cat ever. She was independent, a little shy, quiet and very sweet. Never ill a day in her life. For her sake, I'm glad she went so quickly. Fortunately I also have Figaro, a 12-year-old male silver gray tabby. He's very outgoing and affectionate, but seems somewhat lost without our Theo. Eventually I'll probably get another cat, but not just yet. Really enjoy your blog, and again, my sympathies. Bart! I'm just seeing this now and am so very sorry. My other half and I went through the same with our sweet old girl POSY, a Wheaton mini wire hair doxie, who at 15 and one half years just couldn't keep herself going any long. We put her down in April and the heart break was indescribable. Our creatures are the closest thing we have to stepping out of our human bodies and into some other magnificent world. How we can communicate with them, the bonds and the ties we have with them are miraculous. They are really never gone. Posy visits us constantly in so many ways - a song we hear that reminds us of her, driving in the car on a starry night when the air smells just a certain way, in memories so tangible they seem to be more than in the mind. Missing them is half of the trick, it keeps their essence always present. Our boy, Rupert, also a mini doxie, definitely felt the loss, but he seems to slowly be finding his way without her. Give Bell time, and more attention than you can ever think of.